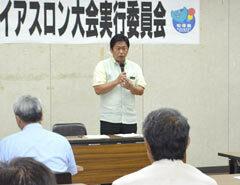 On November 6 at the Ishigaki City Office, Mayor Yoshitaka Nakayama explained the suspension of Ishigaki Triathlon 2014. On November 6, the Ishigaki Triathlon 2013 organizing committee unanimously decided not to hold the Ishigaki ITU Triathlon World Cup 2014 and the Ishigaki Triathlon 2014. The committee will review the timing of the events and the course, and has not decided when the events will recommence. Explaining the decision, the committee referred to the need to reexamine the lack of accommodation due to the increase in inbound tourists following the opening the New Ishigaki Airport. They will also review the competition course because of the increased volume of traffic. Other events such as the professional baseball team Lotte Marine’s training camp and the Ishigaki Marathon are the focus of the efforts of the organizing committee in the City Office, which will review the nature of the organizing committee and relevant management structures. The Ishigaki World Cup, in which the world’s top athletes compete, has been held 18 consecutive years until 2013 and the Ishigaki Triathlon, in which many ordinary citizens compete, has been held a total of 26 times. There was a break in 1995 to review the competition course.